Writer and producer Russell T Davies was presented with the Outstanding Contribution to Writing Award at the annual Writers’ Guild of Great Britain Awards at RIBA in London. 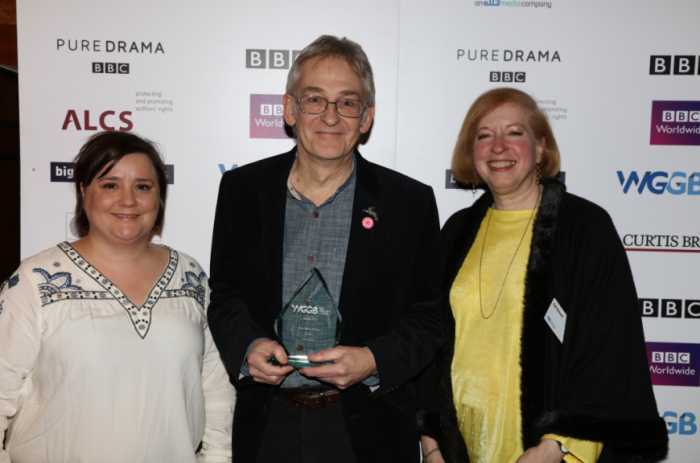 The award was presented by Paul Abbott in honour of his body of work for TV including Queer as Folk, the revival of Doctor Who, and the recent drama trilogy; Cucumber, Banana and Tofu. Davies and Abbott are both members of the Writers’ Guild of Great Britain (WGGB). Comedian, actor and writer Susan Calman hosted the event in front of an audience drawn from a broad range of creative industries. Other winners included Paul King who was awarded Best Screenplay for the film "Paddington"; Armando Iannucci’s "Veep" won Best TV Situation Comedy; Timberlake Wertenbaker took home the award for Best Play for American Revolution drama "Jefferson’s Garden"; Best Long Running TV Series went to Louise Ironside for Scottish soap "River City" and Best Writing in a Video Game was won by Dan Pinchbeck for the game "Everybody’s Gone to the Rapture". A special tribute was made to Writers’ Guild member David Nobbs, who died on 8 August 2015 and was best known for writing the 1970s series The Fall and Rise of Reginald Perrin, adapted from his own novels. Novelist and writer Jonathan Coe gave a speech in his memory. WGGB President Olivia Hetreed said “As President of the Writers’ Guild of Great Britain, I am immensely proud of all our Award winners and nominees, a truly impressive display of talent, from the ancient art of playwriting to the youngest one of game writing. All our winners display not only a superb grasp of their craft but tremendous insight and empathy with the challenges of modern life. The radio awards were presented by Gail Renard; the others by Caitlin Moran, Julia Hardy, Phil Ford, Charlie Hardwick, Jonathan Asser, Natalie Wilson, Helen Edmundsen, Moira Buffini, Helen Lederer, Warren Brown and Paul Abbott. Winner: White Rolls The Dice, by Deborah Frances. Shortlisted: The Casual Vacancy by Sarah Phelps, The Gamechangers by James Wood. ...information sent by Amy Williams and used by permission; many thanks. The Writers' Guild of Great Britain (WGGB) is pleased to announce the shortlist for its annual awards, to be presented on Monday 18 January 2016 at RIBA, central London. The Writers' Guild Awards, which launched in 1961, also give professional writers from across Great Britain the opportunity to honour their peers, and celebrate the importance of writing to the creative industries, both nationally and abroad. Our sponsors this year are: ALCS, BBC Drama, BBC Writersroom, Big Talk, Company Pictures, ITV Studios, Curtis Brown Ltd.
Bird (Laura Lomas), Muddy Choir (Jesse Briton), Three Wise Monkeys (Mike Kenny).